NEO Philanthropy is committed to uplifting the voices of marginalized communities who are our grantees and partners and working to make the world a more equitable place. In honor of Pride Month, we will profile a few of the many organizations, leaders and NEO partners who are making wave across the LGBTQ and broader social justice space. This post features Dani Marrero Hi, Director and Founder of Neta. Neta is a grantee of NEO’s Four Freedoms Fund. Neta is giving the residents in the Rio Grande Valley a place to tell their own story. They create culturally relevant content – videos, podcasts and articles – that amplifies the voices of border residents that directly challenge mainstream narratives. As a Rio Grande Valley native, Dani knew the area needed a platform like Neta because she lived it. 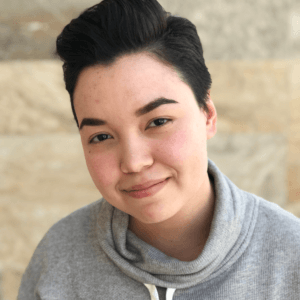 When she watched the news, she constantly heard issues that affected her and the people around her – immigrant rights, LGBTQ rights, health care and reproductive justice to name a few. Instead of hearing stories and experiences from those around her, she heard talking heads trying to paint the picture of a place they’d likely never been. She didn’t see or hear her big, vibrant community with many complex issues, concerns or even successes reflected, so she created a space where she did. Neta may have accomplished a lot in their young history, but they are just getting started. For more information about Neta, visit https://netargv.com/.